Are you a lifelong fan of DC and Marvel superhero comics, curious about manga but put off by the sheer volume of titles to explore? Chris Maka has your back! Super Manga! will explore a variety of manga titles that feature superheroes or very close analogs that you may have find to your liking. Following my article on Tiger & Bunny comes My Hero Academia, a manga (and anime) that, like Tiger & Bunny, features American-style superheroes – only with some Japanese-style cultural differences as we shall see. The premise of My Hero Academia is that some time ago, beginning with the birth of a bioluminescent child in China, people started being born with super powers, commonly referred to as “quirks”. Quirks can be very specific and limited in use (like invisibility) or broad and flexible (like “fire powers”). People born with powers were called “Exceptionals”, but the term doesn’t really get much run in the manga as within a couple generations people born with quirks became the norm and people born without a quirk became the exception. Most people with quirks simply live with them, either not using them or using them to enhance their day-to-day lives. An elite few become heroes, battling villains and rescuing civilians from harm. Unlike in most American superhero comics, becoming a superhero isn’t something an individual simply decides to do on their own because they feel like it. Being a hero is an exalted career choice, requiring advanced schooling and training followed by official examinations in order to get licensed by the state. And also unlike most American superhero comics these days, the state is consistently presented as a caring, benevolent, and generally competent presence in the series. Which brings us to My Hero Academia’s story. 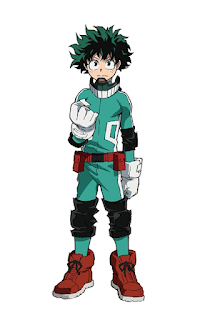 Our main character is Izuku Midoriya [note that I’m using the Western-style first name followed by last name convention in this article], a quirk-less boy determined to attend U.A. High School, the most elite high school for kids who want to become superheroes. Through spoiler means, Midoriya acquires a quirk that gives him super strength and exceptional speed, enabling him to gain admittance to U.A. High School. The series’ primary focus is Midoriya’s development as a student and a fledgling hero. At this point the series becomes “Teen Titans meets Harry Potter” in a very entertaining fashion. 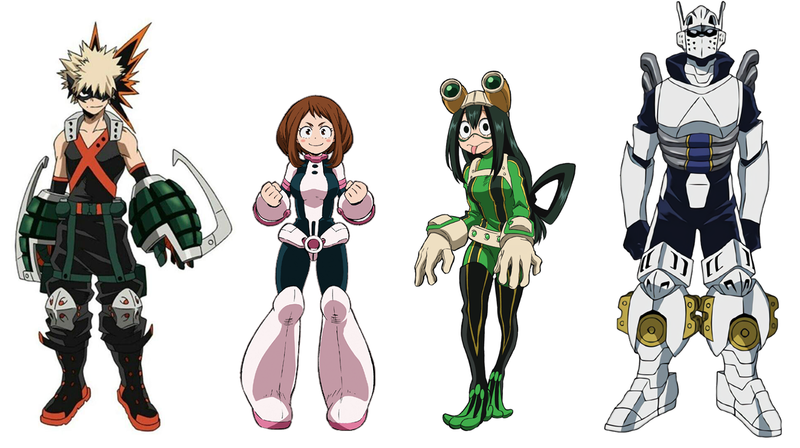 Midoriya is joined at U.A. by a former childhood friend and current enemy/rival, Katsuki Bakugo (whom Midoriya, and later their fellow students, refer to as “Kacchan”, a childhood nickname), a boy with an explosive quirk and a temper to match. While Midoriya has a few friends in his class he is closer to than most, the dynamic that the series is more concerned with is Midoriya’s class as a whole (Class 1-A; about 20 students total, with around half that number playing the most prominent role in the action). The personal stories and interpersonal relationships between the students shapes the dynamic of Class 1-A and its development and fortunes. Fans of team dynamics in American superhero comics will, I imagine, enjoy this aspect of My Hero Academia as well. 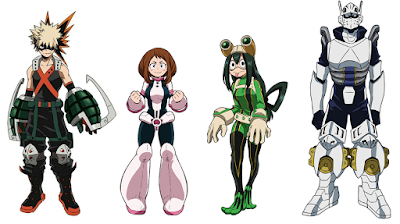 Some of Midoriya's colorful classmates. 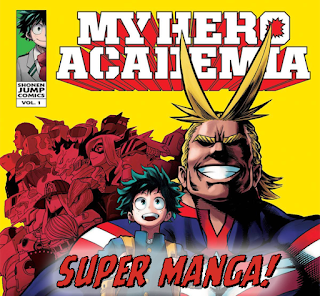 Another important element in the series, and Midoriya’s development as a hero, is Midoriya’s relationship with his mentor, the hero All Might. 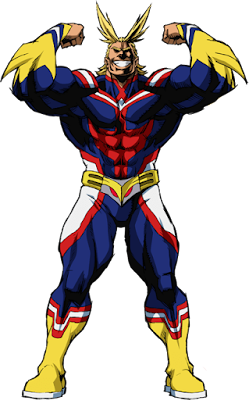 All Might is the most American-style superhero in the series, and is the most famous and most popular hero (he is semi-officially regarded as the “#1 hero”). Well of course he has some silly hair action going on. This is manga. He has a variety of special moves signified by a different battle cry that references a state or city in the United States (e.g. “TEXAS SMASH!” or “DETROIT SMASH!”). He is the “Symbol of Peace” and a major reason why the supervillain problem in the story world is only a minor annoyance and not a major epidemic as the series opens – many would-be supervillains simply don’t bother because they don’t want to get smashed by All Might. 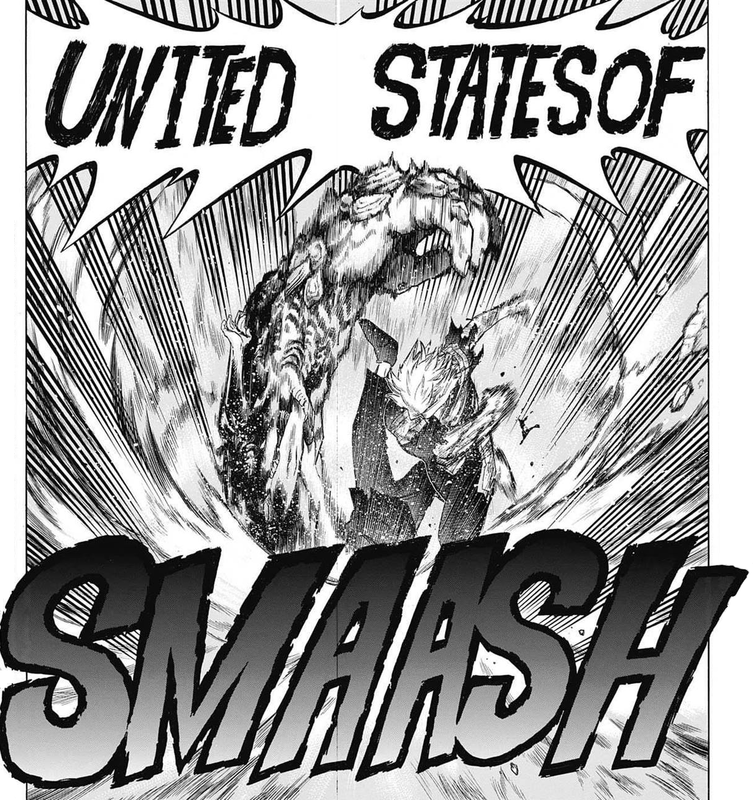 The United States of Smaash is the best United States. Those circumstances quickly change as the series progresses, and a conspiracy of villains emerges, determined to change the status quo and turn things upside down, to create a world where supervillains can operate freely and “the strong” run the show. This becomes the series’ A Plot and dominates the action, giving the reader plenty of hero vs. villain battles to enjoy. As with most action-oriented manga, the action is dynamic, creative, and over-the-top. Most characters wear their emotions on their sleeves, and the story moves at a quick pace. Prominent members of MHA's creepy rogues gallery. The series excels at the kind of weird, unbridled creativity that marks the best manga titles. Many of the hero quirks are weird by American standards and used creatively, and the villains are even stranger and creepier. Readers of American comics will find more here than simply “Japanese-style superheroes”. My Hero Academia is well worth a look.